A Texas chef who has fed San Antonio’s homeless population for the past 10 years from a non-profit mobile food truck was suddenly cited and fined by local police for feeding the homeless. Despite the ticket being issued a week earlier, Joan Cheever, founder of a San Antonio mobile food truck called the Chow Train, was nevertheless out feeding the homeless on Tuesday. There has been an outpouring of support for Cheever after news of the ticket surfaced, which she still has to fight in court in June – and which she said she would do under the Religious Freedom Restoration Act. Cheever told Texas Public Radio she was inspired by the show of support. “It warms my heart but it doesn’t surprise me because the community is behind me and they are behind every other nonprofit that does what I do and there are a lot of them,” she said. A week ago, four bike-patrol police officers stopped in the park where she was feeding homeless people. They asked about her license and her permit. Cheever is a licensed food handler but police found the permit had expired and was issued for a truck – not the car that the food was transported into the park with. Police said she was being cited for transporting and serving the food from a vehicle other than a truck. The ticket carries a potential fine of $2,000. As a result, Cheever said she would fight the ticket under the Religious Freedom Restoration Act, a federal and state law that protects the free exercise of religion, which she says her charitable work qualifies for. She is due in court on June 23. Cheever’s philanthropy is well-established and her efforts were featured on the nationally syndicated Rachel Ray cooking show in November. Cheever's fine is the latest in a series of efforts by local governments to discourage people from feeding the homeless in public space. In Florida, Fort Lauderdale police twice arrested a 90-year old pastor last fall for feeding homeless people. 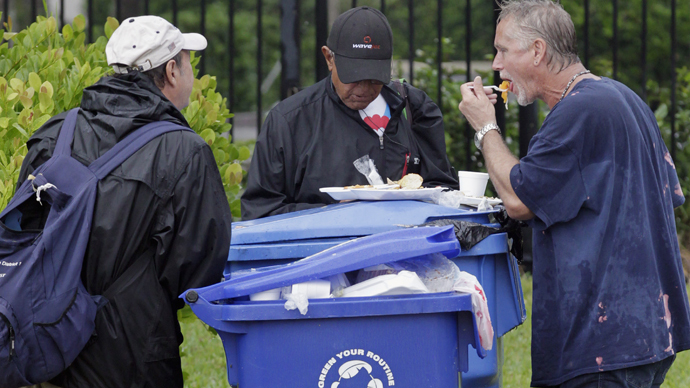 In the past two years, 21 cities have restricted street feeding of homeless people, citing public safety. However, street feeders and their legal advocates say the campaign is part of an effort to keep the homeless population out of sight – and part of a national trend to criminalize poverty. The report argues that while there has always been prejudice and stigma about poverty in the US, the criminal justice system expanded misdemeanor charges in the midst of the financial crisis, which led to an increase in fees, fines and court charges that can be levied. These increases also aligned with the privatization of probation services in operating jails and prisons. The report, for the first time, brings together disparate news stories and studies that illustrate the broad movement underway that involves criminalizing poor people and trapping them in the criminal justice system for errant behavior such as truancy, not paying parking fines or sleeping on a park bench. The report refers to a state-by-state investigation by National Public Radio into the fines, which found that since 2010, 48 states have increased criminal and civil court fees as governments passed many of the costs of running the criminal justice system on to defendants. Apart from targeting the poor with fines, and the resurgence of a “debtors’ prisons,” the report shows increased arrests against homeless people, as well as those feeding the homeless, and suggests that governments are criminalizing life-sustaining activities such as sleeping in public when no shelter is available.